Health Edge Family Spinal Care has been specializing in the N.U.C.C.A. technique for over 30 years. If you are interested in spinal correction without the harsh manipulation of traditional chiropractors, learn more about the N.U.C.C.A. technique below. The N.U.C.C.A. technique is named for the National Upper Cervical Chiropractic Association (NUCCA), which is a non profit group that is dedicated to patient care that uses gentle, safe and painless methods of spinal correction. N.U.C.C.A. practitioners, such as the Health Edge Family Spinal Care, focus on a specific and gentle adjustment of the Atlas vertebra. This gentle and pain-free adjustment brings the vertebra back into its natural position. This vertebra is the top bone in the spine just under the brainstem. It is the first of seven vertebrae known generally as the cervical spine. The Atlas also is called C-1. The Atlas vertebra is named after the Greek mythical hero Atlas, and supports the entire head’s weight. This vertebra that lacks a disc both above and below it. Therefore, the Atlas is the only vertebra that is freely movable in the spinal column. This freedom of movement allows the skull to easily rotate. The problem is that this vertebra is more easily injured and misaligned. If it misaligns, the brain stem may be compressed; this compression can compromise many body functions. The N.U.C.C.A. 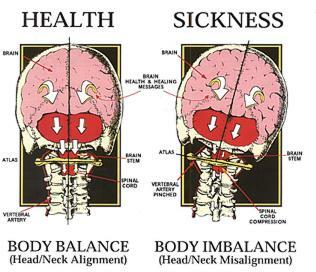 technique emphasizes the importance of the perfect alignment of the Atlas vertebra to ensure that the brain communicates properly with the rest of the body. Many symptoms that people have on the lower parts of the spine, such as in the lumbar spine or lower back, are often caused by a misalignment of the Atlas vertebra. Attempting to restore proper nerve function in the lower spine is ineffective if the cervical spine and Atlas vertebra are not aligned properly. There often are no clear signs that the Atlas vertebra is misaligned. Thus, doctors use several diagnostic tests to check the alignment of the Atlas related to the rest of the spine. They also use tests that are intended to demonstrate how the vertebra is misaligned, as it affects the rest of the body. One of the important diagnostic tools in N.U.C.C.A. care are special, highly calibrated X-rays. Depending upon the case, three different images may be taken to show the exact location and alignment of the Atlas, as well as the surrounding vertebrae and skull. Other tools may be used to check for signs of Atlas subluxation, such as supine leg length analysis, and possibly an anatometer. This device can be used to measure anatomical symmetry, posture and other important bodily criteria. Patients who are diagnosed with Atlas Subluxation Complex will be informed that they need to have a special spinal adjustment to restore the Atlas to its proper location and alignment. First, the chiropractor needs to carefully check the direction, degree and severity of the misalignment. At this point, they doctor can remedy the situation using a highly targeted manipulation with the hands. After the proper direction and angle calculations are performed, the patient is usually ready to have the adjustment done. The manipulation is done with the patient on their side. The practitioner puts himself at the best angle to perform the proper treatment. They typically will put focused force to the Atlas vertebra, using an area at the hand’s base, on the edge of the pinky. The Atlas adjustment is actually very gentle, and most patients do not feel anything when it is done. There is seldom any pain, but some patients may hear or feel a clicking, popping or grinding sound in the cervical spine. Adjustment often takes multiple steps, and several motions by the doctor may be needed to complete the realignment. Once the doctor is happy with the alignment, they may take more X-rays to check if the Atlas vertebra has been properly realigned. Most people think of back pain, neck pain and muscle aches when they think of going to the chiropractor. At Sheppard Spine and Sports Clinic, we can naturally revitalize the health of patients who suffer from myriad medical and health problems. Restoring health is often related to the N.U.C.C.A. procedure to restore proper spinal alignment in the body. When the body has achieved proper alignment again, the nervous system will function at peak efficiency again. The body will then begin to heal naturally, without the use of drugs or the traditional ‘cracking’ and twisting of the back and neck in regular chiropractic techniques. As experienced practitioners of the N.U.C.C.A. technique, we believe in holistic approaches to treating health, and not just trying to relieve individual symptoms. With the use of cutting edge diagnostic technology, we can correct what is thought to be a key cause of many health-related problems – the misalignment of the Atlas vertebra.